Would you like to mount your compatible Garmin Edge or Forerunner device slightly in front of your bikes handlebars? Then you need to buy the Garmin extended bike mount. This genuine Garmin specially designed bike mount simply attaches to the handlebars of your bike to provide a secure, sturdy base for compatible Garmin Edge and Approach* models. Please note: Fits handlebars with a diameter 26-31.8mm. For more help and information relating to installation click here. Compatibility: Compatible with Garmin Edge 20, 25, 130, 200, 500, 510, 520, 520 Plus, 800, 810, 1000, Explore 1000, Touring, Touring Plus, Forerunner 310XT, 910XT, 920XT, Varia Rearview Bike Radar. *Please note: The Garmin Extended Out-Front Bike Mount is only compatible with the Garmin Forerunner 910XT, 920XT and 310XT when used with a quick-release kit (sold separately). 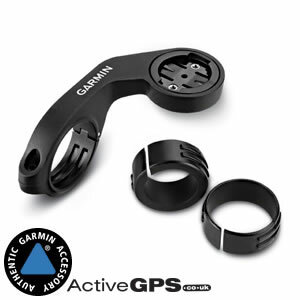 This genuine Garmin specially designed bike mount simply attaches to your bikes handlebar to provide a secure, sturdy base for compatible Garmin Edge and Foreunner* models. What's more it positions your Garmin Edge or Forerunner ahead of your bikes handlebar, putting it in the perfect place to glance and take in your ride information and/or position on installed mapping (Edge devices only). If you'd like to add UK and European cycle maps to your compatible Garmin Edge device you can do just that by buying and installing Garmin Europe Cycle map on SD/microSd card. Once installed the SD/microSD card enables you to select cycling, tour cycling or mountain biking options and then select the appropriate route for the type of cycling you do, taking you on paved roads, unpaved roads, or on paths and trails. Countries included are: Austria, Belgium, Bulgaria, Croatia, Czech, Denmark, Estonia, Finland, France, Germany, Great Britain, Greece, Hungary, Ireland, Italy, Latvia, Lithuania, Luxembourg, Malta, Netherlands, Norway, Poland, Portugal, Romania, Slovakia, Slovenia, Spain, Sweden and Switzerland. View the Garmin Europe Cycle map webpage for more information. ‣Specifically designed for use with selected Garmin Edge/Forerunner GPS devices. What is the Extended Out-Front Bike Mount compatible with? Garmin Edge 20, 25, 130, 200, 500, 510, 520, 520 Plus, 800, 810, 820, 1000, Explore 820, Explore 1000, Touring, Touring Plus Forerunner 310XT, 910XT, 920XT, Varia Rearview Bike Radar. Not the accessory you were looking for? Was it another Garmin Edge accessory, part or map update? If it was click the following links to find your models accessories or maps. Alternatively if you have a question about the Edge vehicle power cable our contact page is the place to go to ask us a question.